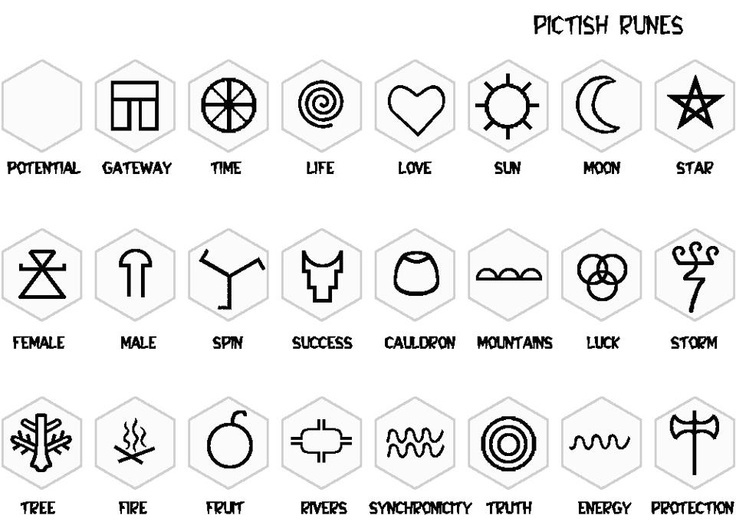 You need to be an initiate of ☽ Witchcraft ☾ to add comments! Making candles is a lot easier than you might think! Here are instructions on how to make your own all natural, safe, and magickal candles. Make sure that your essential oils and the herbs you use smell similarly. First you will need to gather all of your ingredients and lay them out neatly. Take your candle holders and fill them with soy wax and as many colour tablets as you desire. The more you add, the darker your candles will be. Put them in the mircowave (as long as they are not metal - if your holders are metal, melt the wax in a pot over boiling water double broiler style) and melt everything together. You will need to add more and more wax as you go along because melted soy wax yields much less than the flakes. Stir until mixed. Add your herbs/fruit peel pieces and your oils. Mix again. 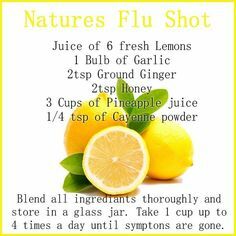 Add your essential oils, as much as you feel is necessary. Mix again. (Optional) You can line up whole herbs against the edges of the mould and they will dry along the edges and make lovely decorations. Ta da! Your candles are ready! Make sure to make them with good intentions and feel free to carve sigils into the top. July brings beach weather just about everywhere in the Northern hemisphere. Among the objects I associate with the beach is shells. Chances are you’ve collected some over the years that have been relegated to a drawer or a box. This craft is meant to inspire you to make your a salt dish or an offering bowl. Select an open shell and others with which to decorate it. Use two-part epoxy, hot glue or other craft adhesive to attach smaller shells, bits of sea glass, charms and pieces of jewelry as desired. Small shells, beads or pearls can be used as legs to keep the shell from tilting. … forming them into a wreath. … gluing them around a bowl, vase, frame, mirror or planter. … dangling them to form a wind chime. … filling a shadowbox or a lamp base with them. … wrapping fabric around a metal tiara and adorning with shells. … melting a tea light, pouring the wax into the shell, and inserting the wick and its holder. Candles are a symbol of Imbolc, which is also known as Candlemas. With some advance planning, you could make your own this year. The easiest way is to buy beeswax sheets and roll of square-braid wick. (The larger the finished candle will be, the larger size wick you’ll want.) You simply cut the sheet as wide as you want the height of the candle to be. A straight edge and a craft knife work well, but other items in your kitchen will also suffice. Cut the wick about an inch longer than the wax. With a blow dryer, warm up one end of the sheet. Place the wick close to the edge and carefully fold the end of the wax over it and press it down. Warm the whole sheet, which will make it easier to roll the candle. (Candles can be made without the blow dryer as long as you are not working in cold conditions.) Carefully roll up the candle as tightly as possible, checking to make sure the edges are straight. Gently press the end of the sheet into the candle to seal it. Clip the wick to about 1/4 inch before lighting. Concentrate on your intent while making your candles, perhaps chanting or first casting a circle. Dried herbs or scented oils can be sprinkled onto the wax before rolling. With no previous experience, my first time I made several sets of votive-sized candles in the four directional colors that have served me well. I find it meaningful when the candles on my altar are ones that I’ve made. Other candles that might interest you can be made by melting wax and pouring it into a mold or container. Pre-made candles can be customized by dipping them in wax to which oils, colors, herbs and crystals have been added. A word of caution: wax is extremely flammable. 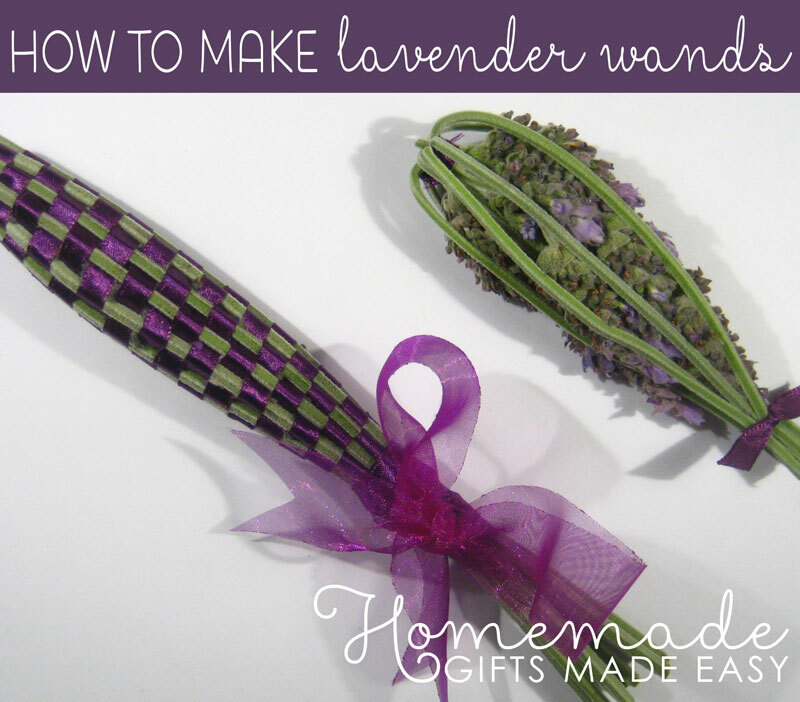 Once you’ve learnt how to make lavender wands and bottles, you’ll wonder why you never made them before! These fragrant little bundles look gorgeous, smell wonderful, and make cute gifts :-) Lavender is a natural moth repellent , so lavender-wands are traditionally placed in closets or drawers, where they keep clothes moth-free and fresh-smelling. 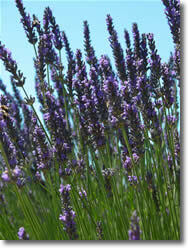 Lavender is used in aromatherapy for its relaxing qualities . A wand combined with somehomemade lavender bath salts or bath bombs makes a great “relaxation pamper kit”. 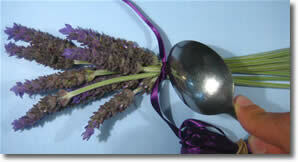 Also, lavender is reported to help people sleep - a wand placed under your pillow will send you off to sweet dreams. 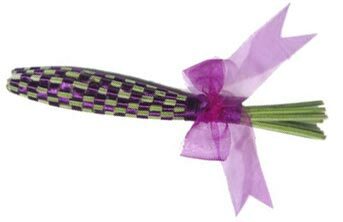 You can even use a lavender wands as an air freshener in your car - don’t fall asleep though! 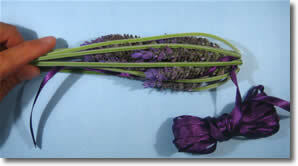 Once you weave a lavender wand, it keeps its scent for months . If the scent begins to fade, you can squeeze the wand it to release more fragrance. In ancient Rome, lavender was used to scent bath water. The very name ‘lavender’ comes from the Latin lavandus , meaning ‘to wash’. Okay, on to the details of how to make lavender wands and bottles. First up, you’ll need to gather your lavender. But if you like, you can skip ahead to the instructions for lavender bottles(easy!) 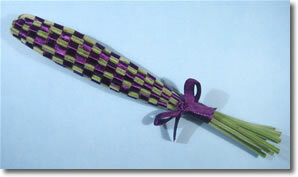 or lavender wands (slightly trickier, but still pretty easy). 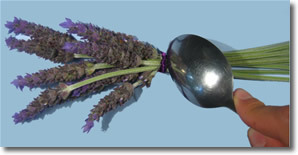 The first step in learning how to make lavender wands is gathering the lavender. 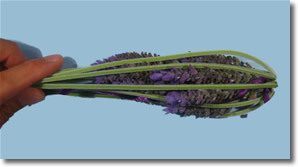 Collect 7-15 fresh lavender stems, with at least 8" (20cm) of stem below the flower. Ideally, you want young flowers that are still in the bud. If the flowers are in full bloom, then they tend to fall off the stem as they dry. Not a big deal, but your lavender wand might shed a few lavender crumbs in your closet. Use a long-stemmed variety of lavender if you can find it, but you can also use regular lavender - just remove the leaves from the stem. As with most herbs, the best time to pick is in the mid-morning after the dew has evaporated. Now onto the instructions for how to make lavender wands and bottles. 7-15 lavender buds/flowers, with long stems. 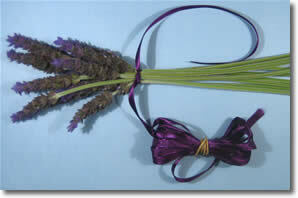 Step 1: Lay the lavender stems side by side, with the flowers staggered in two rows. Staggering the flowers like this makes a long slender bottle, whereas lining all the flowers up on the same level makes a short fat bottle. Step 2: Tie some ribbon tightly around the stems at the base of the flowers, and snip the loose ends of ribbon close to the knot. Step 3: Use the edge of a spoon to squash the stems just near the knot. This makes the stems easier to bend without snapping in the next step. Step 4: Bend the stems to form a cage around the buds. Try to space the bars of the cage evenly. Step 5: Finish off by tying ribbon around the stems at the base of the cage. Trim the excess stems. Tip: Don’t place the lavender bottle directly against fabrics for the first few weeks after you make it, because green pigment can bleed from the stems before they dry out. 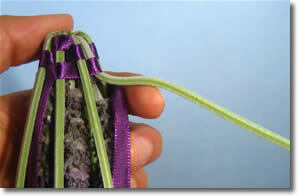 Now that you have made these easy lavender bottles, why not learn how to make lavender wands? 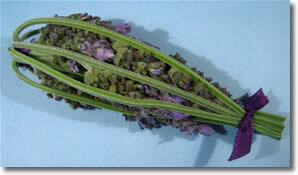 7-15 lavender buds/flowers, with long stems. 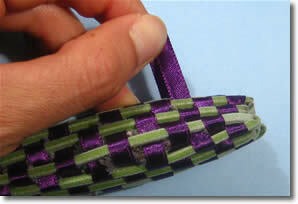 You need an odd number of stems for the weaving to work. 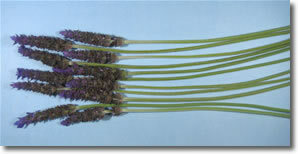 Step 1: Lay the lavender stems side by side, with the flowers staggered in two rows. Staggering the flowers like this makes a long slender wand, whereas lining all the flowers up on the same level makes a short fat, fat, wand. Step 3: Gently squash the stems with the edge of a spoon, just next to the ribbon. This makes them easier to bend without snapping in the next step. Step 6: If bits of flower stick out between the stems and ribbon, poke them back into place with a toothpick. Step 8: Wrap the spool-end of the ribbon around the base a few times, then tie it to the loose-end that you left poking through the bottom of the cage in step 4. Don’t place the lavender bottle directly against fabrics for the first few weeks after you make it, because green pigment can bleed from the stems before they dry out. 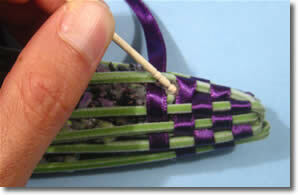 If you find the weaving gets loose after a couple of days as the lavendar dries, you might like to tighten it up again. 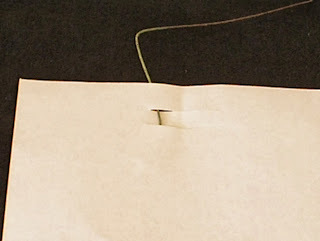 A partially-open paperclip works well to help grab the ribbon - thanks Diane for the tip! Thai herbal massage compresses, or leuk-pra-kop as they are locally referred to, are a blend of medicinal herbs and essential oils, wrapped in a muslin ball. This ball is then heated, usually by steaming, and applied directly to the energy lines of the body. Filled with an assortment of herbs including turmeric and camphor, the heat releases the healing properties of the herbs. Applied to the body in strategic areas, the compress relieves stress and tension while promoting healthy circulation. Each ball can be reused multiple times by the same person. I don’t know what it is about fish crafts, but I’m obsessed. When I found out the Kids Craft Stars Challenge this month was all about using buttons in a kids craft, I jumped with excitement at the chance to create this simple button fish craft for kids. The buttons add a perfect texture to the fish craft since they pop off the page and the little hole reinforcer bubbles are perfect for kids who love to play with stickers (because what kid doesn’t like to play with stickers, right?!). This fun and colorful fish craft is perfect as a summer kids craft and bonus, there are so many great books you use to go along with this craft (find a list of recommendations near the bottom of this post). 1. Start by cutting of a section of your brown paper lunch bag for ocean sand and glue it to the bottom of your blue cardstock paper. 2. Arrange your buttons on your blue cardstock paper where you want to add your fish. Now cut out triangle shaped tail fins for your fish and glue both the tail fin and buttons onto your paper to make all of your fish. 3. Crinkle up some green tissue paper pieces and glue them along the bottom of your paper to make plants. 4. Glue your small googly eyes onto your fish and use your black marker to make a mouth on each of your fish. This is a FUN craft that your children or any faerie lover will love and appreciate! They can be used in bedrooms when someone is afraid of the dark or even in the garden to give it an extra touch of magick. Start with a mason jar with a lid (a spaghetti jar works well too!). Gather some diamond glitter (glittery pieces of glass or plastic thats the size of resin incense - can be found it craft stores). Break a glow stick and pour the liquid over the glittery pieces. Be very careful to make sure that your kids dont decide to drink the liquid - or your pets either! Shake up the mixture and VOILA...instant faerie nightlight! Put the star aside and begin building your ring. 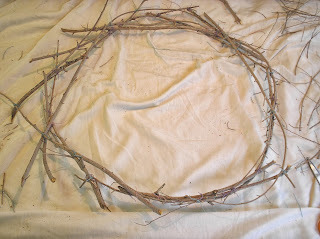 Choose some of the more sturdy branches and lay them in a circle. Once you have a complete circle, tie the sticks at each crossing. It is easier to secure your base now and then build on it. Continue adding branches, securing them as you go. Once you like the look of your ring, finish securing it at all points where the branches cross. The more points secured the more sturdy the wreath. When you feel you are finished, pick it up and hold it as if it were hanging. Secure any fragile areas. Now you are ready to add your star. Place your star in the middle of the ring and secure it to the inner sides of your wreath. You may wish to add a few decorative twigs to the inner area both for interest and to fill in any gap between the star and the outer ring. If you wish to hang your wreath by a string or ribbon tie it onto the wreath now. Trim off any excess string. Next, create your scrolls. If your paper is not already cut into squares, do so now. Cut two small, parallel slits in the top center area of each square. This will create a strip under which to thread your twine. 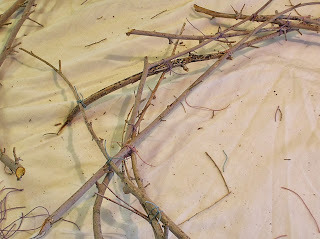 Cut a length of twine for each square. 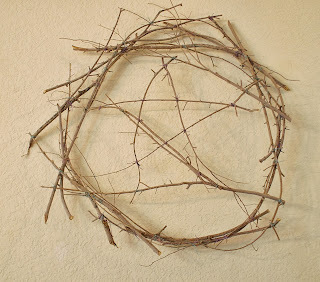 Twine should be long enough to go around the scroll and then tie it to a spot on your wreath. 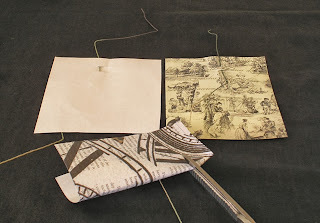 Insert a piece of twine under the slit in each square with the ends showing on the printed side of the paper. Hang your wreath and leave a stack of scroll papers and pen nearby. Invite friends and family to fill write something they wish to release on one scroll and something they wish to invite on another. Roll each paper into a scroll and secure it to the wreath. I usually tie the things I wish to release widdershins down the left side (counterclockwise) and those things I invite down the right. As part of your Samhain ritual, toss your wreath into the fire to release intentions to Spirit.